question of interest. .. i see a few posts that delve into the maths but not much on the actual practical side of things. how to CUT an internal gear??? shape, using either a full or partial gear cutter. (and basically they are both the same anyway, just the diameter of the cutter differs, and the number of strokes/DOC). sourcing it out costs money i dont have. no laser wire water or similar cutting.. plus i need precision, and width. has anyone actually tackled the process? i sorta need small internal gears. about the size of whats in a bicycle hub. possibly in productio n, so its worth spending some time making a broach. take fairly long blank of tool steel. turn to required OD, and taper to base circle of gear. cut the blank as an external gear with matching proportio ns to requisite internal gear. if i was smart i would have cut a fairly steep square sided thread down the blank on the first setting, but now i would do it if i hadn't. carefully grind relief on all the teeth so formed. i forgot to harden the steel didnt i? it would need finish grinding. ..
simplest way is to "thread" a grinding wheel so it resembles a hob and run the cutter on centres. sounds like a lot of work to make a gear...bu t the end result would be worth it... especiall y as i might have reason to pop out 50 or so, more in the future. Sounds like your far ahead of me.. I just 3d print the small gears I need.. cutting internals other than in 3d isnt something Ive tried. Im lucky enough Ive been able to leave the tough stuff to the machinist s. Ill leave this one to anyone who's been brave enough..
Ah yes, the inexpensi ve, fast, accurate gear maker that can cut tool steel like butter. Sorry, there is no free lunch. What I see most people in your shoes do is design around off the shelf parts. I've done some concave segments of NCGs, with a flycutter on a CNC, but I haven't had the time to put together a "Miniature CNC Shaper" for internal gears. The NCG results were okay for sort of high speed, but not for power transmiss ion. Most of my projects involve coordinat ed motion, with little force on the gears. I only cut leaded brass and steel. The only internals I've cut have been on a wire EDM. If it's a prototype, you may be able to find someone local that can at least make 1 for you to prove your concept. One way is a vertical slotter on a mill. Technical ly you need a profile ground tooth form per DP and number of teeth. Cut one tooth and index next tooth and rinse and repeat. However if you want to cut say 70 teeth 24 DP [ you mentioned cycle hub size ? ] if you use a bought gear so 60 teeth and used this as the tool as you fed in it would cut one central tooth to full depth and the ones to the side at a lesser depth. However when it's revolved to the next tooth the 'cutter' cleans up and forms a pretty good involute profile. The bought gear needs to be hollow ground and as it only cuts on a few teeth then you have umpteen fresh cutters to use as you revolve the pinion gear. You will also have to play with the ID and depth of cut as there will be no allowance on a correct sided bought pinion gear for clearance . 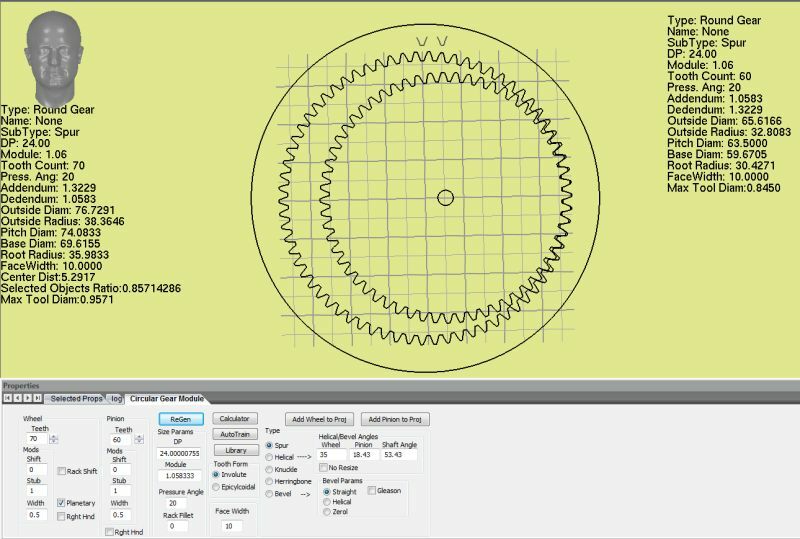 If you use an early version of Gearotic, it will give you the outline of the cutter necessary to cut the gear. For internal gears, the tooth form is different from external gears so you cannot just use an external tooth form. I've made internal gears by making a single tooth cutter and then shaping each individua l tooth. I used a milling machine to hold the cutter and push it through the brass (in this case) gear blank. Cut about 0.050" at a time IIRC. Rotary motion of the gear blank was via a Sherline digital rotary table which made it easy.